This is my fourth(!!) BM style from Ewa Michalak. 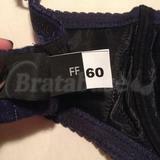 I emailed Jaimie from Bra Obsessed about this bra back in early December. I had noticed that the stock of this bra was getting low on EM's website, so I emailed Jaimie to see if she could find out from EM whether they had enough fabric leftover to make a set for me. Evidently, they did! I got the 60FF and matching size 34 thong to go with it, and the set arrived in late January. I've worn it three or four times now, so I have a concrete idea of how this fits compared to my other BM bras!